I'm generally a fan of winter. I love dark nights and being all snuggly and warm at home while it's blowing a gale outside. By the middle of January however, like the rest of the UK I think, I'm starting to flag a bit. There's only so many days without a hint of sunshine you can take before it starts to make you feel a little bit blue (or maybe grey would be a more accruate description). Definitely a touch of SAD I think. There are a couple of things that manage to pick up my mood a little though. Perfect with a raspberry, lemon and white chocolate chip muffin. Not the best photograph of this page - which comes back to the whole problem of not enough light around at the moment. I love this photo of Grace. I don't recall why I had it printed at 9x6 - I'd probably meant to scrap it at some point, and now I have. Lovely spring colours to perk me up a bit. There is hope I think. Hope that perhaps Spring is on its way? I love the LO, especially the flowers; and that pic of Gracie certainly helped my January blues a bit! Here's to a long hot summer for us Brits; we could certainly use it! Ek! 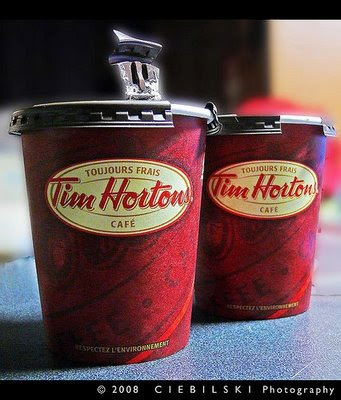 I didn't know you got Tim's in your neck of the woods!?? That is a gorgeous layout - I just loved that stage when the littlies first started cruising round the furniture. Now of course they jump on it - noisily! Glad you liked my daffodil :-) It's got 10 little friends now! Beautiful page! It is amazing when they manage to stand isn't it!